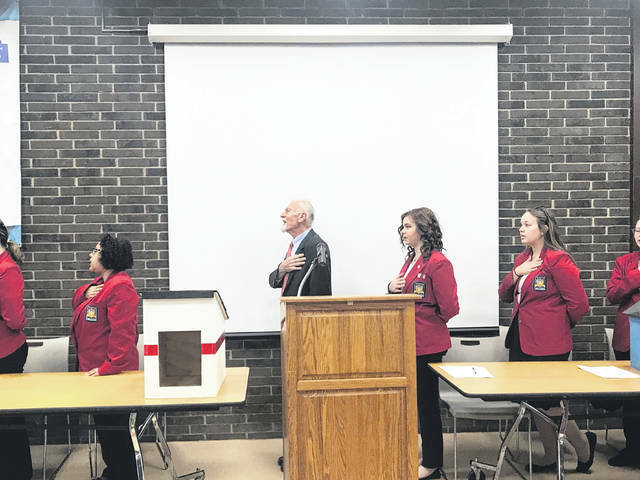 The Buckeye Hills Career Center local chapter of SkillsUSA held its monthly meeting on Friday, March 22, 2019. Gregory Ervin, Commander of the American Legion Jefferson Howe Post 81 attended and served as the special guest speaker. Ervin came and spoke with students about the history and importance of the Pledge of Allegiance. Supporters of the program said all too often, it is forgotten the significance of the Pledge of Allegiance and its importance to the country. For the past 127 years, the Pledge of Allegiance has been recited daily in the country. Pictured is Ervin from American Legion Jefferson Howe Post 81 leading the SkillsUSA members in the Pledge of Allegiance.